This is a snippet from a CML Pro dossier published on June 8th, 2107. Today we are adding Oclaro Inc (NASDAQ:OCLR) to our 'Companies to Watch' list, with an eye on adding it to Top Picks if the company can execute and address the risks we will discuss below. As always, before we discuss any company, we first discuss the themes and markets it is pursuing. Oclaro fits into a very similar space as another Spotlight Top Pick for CML Pro, and that means we start with data, speed, bandwidth, and the cloud. Demand for bandwidth and low latency in the core network continues to explode, with video services, cloud computing, voice over IP and social media driving more network traffic. As the company puts it, with the explosive growth of internet traffic, the amount of data generated in a single day has reached exabyte levels (1 exabyte = 1 billion gigabytes). Today, billions of dollars are invested annually by data service providers as well as other enterprises for building data centers to store and process unprecedented volumes of data known as "Big Data." Borrowing from our dossiers surrounding two of our Spotlight Top Picks, this is how we try make the revolution that is data explosion feel like something understandable. A revolution has been brewing in the Telecom and Datacom worlds. That revolution is speed. The speed at which data and telecom can move -- to our homes, to the cloud for enterprises, from our IoT gadgets, for our streaming video and for the world's data to build artificial intelligence. The growth in traffic increasing 1,000% in six years. But here's how that translates into data. This is the guts of technology and there will be winners. Those words and that chart are hardly enough to encapsulate the data revolution, so we go further. I know this seems like it flies in the face of everything you've read from the main stream media, but, the main stream media often has no idea what it's talking about. In fact, it's that reality that likely led you to CML Pro. Keep in mind, that is per smartphone, so it's not just data consumption rising due to more subscriptions, but rather each subscription in and of itself is going to show massive growth. Further, projections tell us that 80% of all our content consumption by 2020 will be video. That is 50% year-over-year compounded annual growth for six straight years for video data traffic. That translates into over 1,100% growth in six years. All of this information we just looked at is predicated on something very big - it is the next generation (often time called 'G') of mobile networks. Alright, this is what we mean by "Big Data" and the data revolution. Now let's talk about how this data gets processed. Processing Big Data requires the massive parallelism of Cloud Computing, where the computation core is the network of servers in a data center. A "Mega" Data Center can house over 100,000 servers, all of which are inter-linked to function as a flexible, parallel computation engine. To realize efficient and powerful computing, interconnects between servers and switches must operate continuously at high speeds (40G-100G); negligible latency; low power; and over long distances. These features must be realized in a highly reliable, low cost product. Optical fiber interconnects are the only way to meet such requirements. 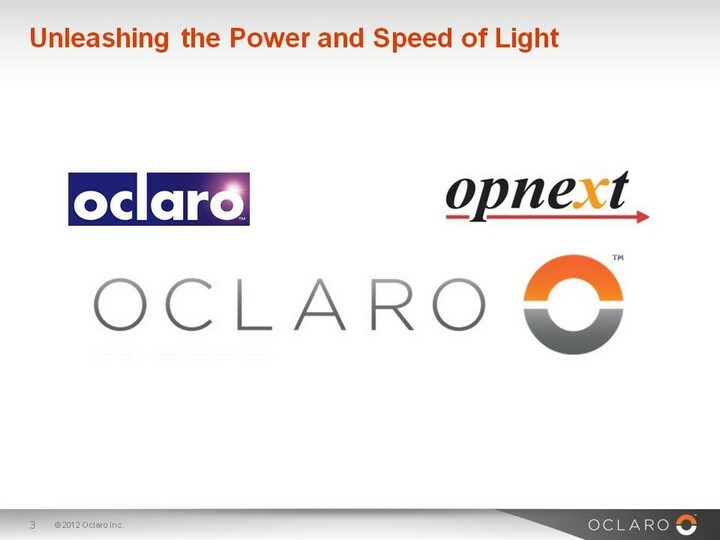 Oclaro has developed the world-leading InP optical devices technology that enables high speed optical interconnects. The company's vertically integrated transceivers are a critical piece of the modern data center infrastructure and continue to give the edge needed by both cloud service providers and general enterprises to succeed in the age of Big Data. This is the world we are living in with Oclaro, now let's talk abut the company. Oclaro Inc is a provider of optical components, modules and subsystems for the core optical transport, service provider, enterprise and data center markets. The Company provides various solutions for optical networks and interconnects driving the next wave of streaming video, cloud computing, application virtualization and other bandwidth-intensive and high-speed applications. Before we turn to detailed successes, failures and risks, we can start with the financials and how two charts have turned this into a CML Pro company to watch, and two other charts are equally important. Revenue (TTM) has increased for seven consecutive quarters which triggers a "trend." Revenue has now reached $577 million compared to last year when it was $365 million, which is a 58.1% one‑year change. But, this is not one of the two charts that compelled us to discuss the company. Next we turn to gross margin%. Gross margin % for OCLR is 37.1%, up from 25.2% last year, which is a 47% one‑year rise. When dealing with companies that have hardware and services, we pay special attention to gross margins. If the measure is decreasing, we're looking at a company with weakening pricing strength -- that means competition is coming. With Oclaro, we see the opposite. We'll discuss why this is happening in the rest of this dossier. But, this too is not one of the charts that compelled us to write about the company today. Cash from Operations (TTM US$ Millions) for OCLR is $66.8 million. Last year it was a negative $4 million. Yes, the company is now cash flow positive as well. Those last two-charts are the "why now," and now we can take a deep dive into Oclaro -- beyond some financial charts and talks about a thematic push. In the center of that wheel we see the critical items -- cloud, data center, metro, China and 5G. With nearly 7-fold growth, there is reason to be bullish. This is $400M market going to over $2 billion by 2020 -- or a five-fold rise. Port count gets to the metro and 100G & beyond coherent market. Oclaro sees the TAM growing from 220,000 ports to over 700,000 ports by 2020, or 25% compounded annual growth. Global network traffic is growing at a rapid pace, fueled by bandwidth hungry applications such as video on demand or the wide use of smartphones. As a leading provider of transport components and solutions, Oclaro enables this growth through innovative high data rate products targeted for the metro and long-haul segments of the transport market. The company's DWDM product portfolio ranges from 10G all the way to 200G, and includes direct-detect and coherent solutions in various configurations, such as line cards, MSA transponders, pluggable transceivers, and components. We can see, across the speed spectrum, that Oclaro has products in production and in development to satisfy the bursting needs for speed and data handling. Now, let's talk about what Makes Oclaro different from its competitors. Oclaro invests its R&D where their technology innovation delivers real value and differentiation for the customers they serve -- that's how they put it. The company's differentiation comes not just from its advanced (and proprietary) technology in these areas, but also from vertical integration. The integration goes from fabrication and design, to miniaturization and packaging, and finally actual integration. In the optical network realm, the world is hungry for the bandwidth, speed, reach and flexibility to run new applications such as streaming video, social media, cloud computing and voice over IP. Oclaro supplies optical products at the component, transceiver, and module level, including tunable lasers, receivers, and modulators, that are needed for high-speed transmission, and we are leading the fastest growing 100G segment. In the enterprise network and data center realm, Oclaro supplies client-side and short reach optical transceivers at 10G, 40G, 100G and, in some cases, less than 10G, into data communications and enterprise solutions. This, holistically, is the Oclaro story. Now, we must turn to some serious risks. This is pretty similar to the cloud world, where Amazon, Microsoft and Alphabet make up the lion's share of cloud platform revenue for the world. But, for Oclaro, risk goes even further. Fully 36% of sales came from China in the last quarter, which is down from 42% in the quarter prior, but make no mistake, as China goes, so too goes Oclaro. Even further, ZTE and Huawei announced that they were building up an optical component inventory if the government sanctions Chinese telecom vendors. But, then there is more risk, specific to Huawei. The New York Time reported that Huawei, Chinese Technology Giant, Is Focus of Widening U.S. Investigation in late April of this year. American officials are widening their investigation into whether Huawei broke American trade controls on Cuba, Iran, Sudan and Syria, according to an administrative subpoena sent to Huawei and reviewed by The New York Times. The Treasury's inquiry follows a subpoena sent to Huawei last summer from the United States Department of Commerce, which carries out sanctions and also oversees exports of technology that can have military as well as civilian uses. As of now, Huawei has not been accused of wrongdoing, but anything bad that happens to Huawei is bad news for Oclaro. There is similar trouble for ZTE. So, we live in a world where the two largest customers for Oclaro are under scrutiny and that means there is a potential black swan news event out there. It's low probability, it's a non-trivial possibility, and if news breaks, this stock could get crushed. The other argument is, and should be, that if Oclaro's business is strong, the wild market swings that could come from weird U.S. court cases aren't a long-term risk -- they are an intermediate-term risk. While 11.92% shares are held by insiders and 5% owners, "only" 46.00% of shares are held by Institutional & Mutual Fund Owners. It's understanding technology that gets us an edge, and then finding the gems that can turn into the 'next Apple,' or 'next Amazon,' where we must get ahead of the curve. This is what CML Pro does. The author has no position in Oclaro Inc. Please read the legal disclaimers below and as always, remember, CML Pro does not make recommendations or solicitations for the sale or purchase of any security ever. We are not licensed to do so, and wouldn't do it even if we were. We share research and provide you the power to be knowledgeable to make your own decisions. The Company specifically disclaims any liability, whether based in contract, tort, strict liability or otherwise, for any direct, indirect, incidental, consequential, or special damages arising out of or in any way connected with access to or use of the site, even if I have been advised of the possibility of such damages, including liability in connection with mistakes or omissions in, or delays in transmission of, information to or from the user, interruptions in telecommunications connections to the site or viruses.